Originally commissioned by and published on the Boating Times Long Island site, February 1, 2015. As a nature photographer who loves the beaches and other shorelines, winter doesn’t always appeal to me as much as the other seasons. However, the annual return of the snowy owl is one of the things I anxiously anticipate as the weather grows increasingly colder. Snowy owls spend much of their time in the northernmost parts of North America, breeding and living in areas including Alaska and Canada. During the winter, however, the owls migrate south to look for food along the entire northeastern seaboard of the United States. 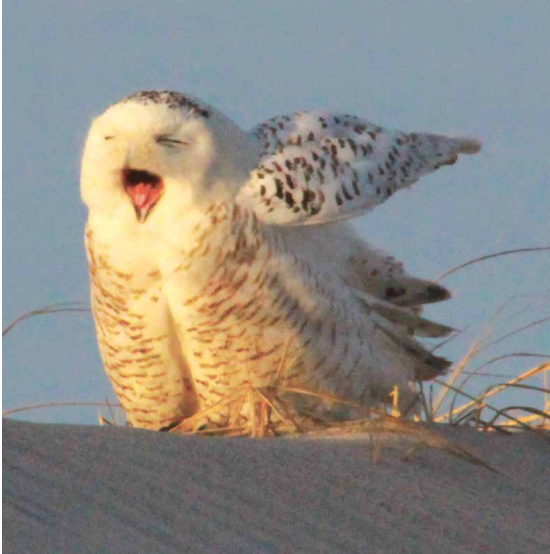 So while we’re shivering and inclined to stay indoors all winter, the presence of visiting snowy owls is a reason for Long Islanders to spend more time outdoors. With their golden eyes emulating a fierce sunset and their brown-spotted, angelic white feathers, snowy owls are among the largest of North American owl species — their height and length can each measure up to 27 inches; their length with wing span can measure up to five and a half feet! Highly nomadic, snowy owls can be easy to spot during the day if you are patient and have a keen eye. They have been sighted in western locations including JFK airport and the Rockaways, and as far east as Orient Point and Montauk. They love to perch in the high dunes along the beach, or rest in the marsh, as they alertly await their prey (they feed on small to medium-sized mammals, particularly lemmings, fish, and other birds). They often fly in pairs though I have seen them split apart to hunt. Unlike other owl species who camouflage themselves and may only be active at night, snowy owls hunt all day, allowing me to photograph them in the best light. When their hunger is sated, they seem to become quite cozy, resting upon the dunes at the beaches, looking as if they are falling asleep as day turns to night. As with all wildlife, be wary and keep your distance no matter the time of the day or the owls’ level of activity. This advice holds true if you wish to photograph them (and other amazing wildlife) — keep your distance, respect them, and if possible, invest in a long lens for your camera so you don’t disturb them or their nests. Snowy owls are keen hunters with sharp beaks and predatory talons; they are protective parents who will actively and aggressively protect their nests. 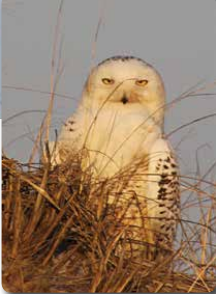 The snowy owls, protected by the Migratory Bird Species Act, are not classified as an endangered species. However, their numbers are declining due to reduction of their food sources, climate change, collisions with cars, power lines, and hunters. This entry was posted in Uncategorized and tagged animals, artist, beaches, birds, heidi lechner, long island, new york, owl, owls, photographer, raptors, snowy owls, wildlife, writer on March 17, 2019 by Rainbow River Art. Name a Long Island shore bird besides seagulls. Did bald eagles come to mind? If not, you’re not alone, as many may never consider these raptors to be residents of Long Island. Yet bald eagles live here as well as all across the country. While we’re clearing up matters, it should be noted that bald eagles aren’t actually bald (in Old English the word “bald” meant “white,” the color of the head and tail of the bald eagle). Native Americans saw bald eagles as chief over all winged creatures because they fly higher than other birds, and the bald eagle, unique to North America, was selected as the symbol of the United States in 1782. Bald eagles are carnivores that live approximately 30 years in the wild. They measure 34 to 43 inches with wingspans ranging from six to eight feet in length. Females tend to weigh as much as 14 pounds while males average about 10 pounds — their lighter weight makes them more agile in capturing prey including fish, rodents, waterfowl, and birds. Bald eagles stay with the same mates and have new hatchlings yearly. Their nests are large at five to six feet wide with a height of three or four feet; the birds will reuse and add on to the same nest annually. Bald eagles are powerful fliers. They fly approximately 40 miles per hour when gliding and flapping in pursuit of prey and can dive at speeds of 75 to 100 miles per hour. Their vision is quite remarkable — they are able to see eight times the resolution of a human, so depending on their size, they may be able to spot prey two miles away! Bald eagles travel far and wide to hunt for food and rely on their powerful talons to kill and capture their prey (however, they are not picky and will steal food from other birds). 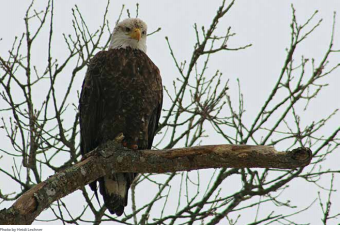 Hunting for food, bald eagles will search land near lakes and rivers, and over open water. They are territorial and dangerous. Do not approach a bald eagle or a nest — they are protected by law and cannot be disturbed, harmed, or killed. These birds are a clear and irreplaceable indicator when it comes to measuring the ecological system in which they live. In the 1700s, the bald eagle population was estimated to be in excess of 300,000. By the early 1900s, they became threatened — nesting pairs dropped to about 500 and they were on the brink of extinction. Pesticides such as DDT imperiled them further until environmental restrictions were put in place and the bald eagles rebounded, raising their numbers to 5,000 nesting pairs in the lower 48 states. The bald eagle is still at risk from illegal hunting and intrusions into their nesting areas, power line electrocution, and pollution. Bald eagles reside mainly in the lower 48 states and Mexico. They are protected under the 1918 Migratory Bird Treaty Act, the 1940 Bald Eagle Protection Act, and the 1966 Endangered Species Act. Known causes for death are lead, oil, and mercury pollution; predator and/or human intrusion of their nests also cause death. According to the U.S. Fish and Wildlife Service, the bald eagle was upgraded from “endangered” to “threatened” in 1995 due to a promising growth of populations. “Endangered” means a species is considered to be in danger of extinction throughout all or a significant portion of its range. “Threatened” means a species is considered likely to become endangered within the foreseeable future, but is not currently in danger of extinction. 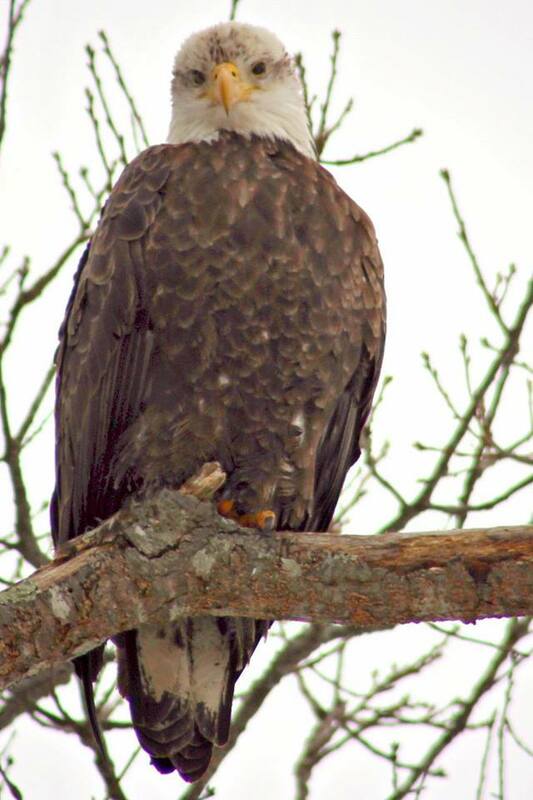 In 2007, the bald eagle was delisted by the U.S. Dept. of the Interior. The bald eagle is the United States’ proud national symbol of freedom and liberty. In 1782, after six years of debate, the United States Congress selected this bird, mainly because it is only found in North America, which makes it a “true American.” The wings represent freedom, and this strong, majestic bird represents the pride, strength, and leadership of our growing nation. In early Christianity, the bald eagle was seen as hope and strength, which represents salvation. The bald eagle has been a symbol to many cultures all over the world. Throughout history, the bald eagle has represented vision, strength, power, courage, wisdom, nobility, dominion, and ferocity. During the early months of 2015, I was fortunate to witness these majestic birds on more than one occasion in various locations on Long Island. Words cannot express the elation I felt when I witnessed a bald eagle in the wild for the first time. Each and every time I see them, I feel prideful knowing our Island is host to these amazing creatures. It speaks largely of the health and beauty of our home. This bird was one of the most magnificent and majestic animals I have ever graced my eyes upon. I never felt more honored or humbled to witness a wild creature such as this incredible bird. We must take pride in our nation’s symbol and respect it. It is my personal hope and wish that bald eagles continue to flourish and prosper, as they represent our freedom and pride, we as a nation, and people as a whole. This entry was posted in Uncategorized and tagged animals, bald eagles, birds, eagles, heidi lechner, long island, new york, photography, rainbow river art, raptors, writer on March 17, 2019 by Rainbow River Art.